^ Giddins, 2001, p. 24. ^ Giddins, Gary (2001). Bing Crosby: A Pocketful of Dreams. Giddins, Gary (2001). Bing Crosby: A Pocketful of Dreams – The Early Years, 1903–1940. Little, Brown and Company. ISBN 0-316-88188-0. http://books.google.com/books?id=Oa2_zcwucAgC. Grudens, Richard (2002). 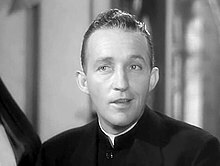 Bing Crosby – Crooner of the Century. Celebrity Profiles Publishing Co.. ISBN 1-57579-248-6. http://books.google.com/books?id=Mkz_w-WYiMAC.